Percilla was born 26 April 1911 in the town of Bayamon, just south of the Puerto Rican capital of San Juan. Percilla's claim to fame was a condition known as hypertrichosis, which is characterized by excessive hair growth and abnormal dentition (two rows of teeth in her case). Even as a child Percilla's hirsuteness drew attention from both the public at large and the medical community. As a baby, Percilla and her parents traveled to New York City to be examined by a team of doctors. She remained in New York for seven months before returning to Puerto Rico. 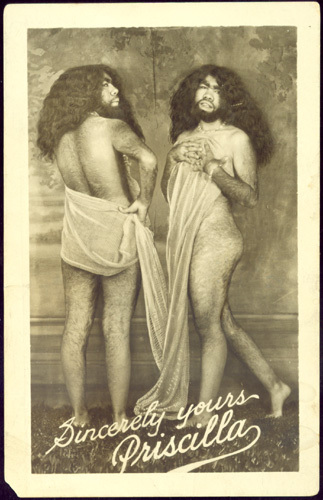 Percilla's father, a native of Spain, thought his hairy daughter would make an excellent sideshow attraction, but didn't know how to go about it himself — especially as his knowledge of English was scant. On a subsequent trip to the States, Percilla's father approached showman Karl L. Lauther, who took an immediate shine to Percilla. Lauther put her on his show and hired a woman to help her father look after the little star, now known as "the Little Hairy Girl". Percilla's father stayed with her for a while, but was tragically shot and killed one night in Gainesville. According to Percilla's father's wishes, and with the help of an attorney, Lauther became Percilla's new adoptive father. By all accounts Lauther treated Percilla well, but did not fail to exhibit his daughter at every possible opportunity. It was while in his employ that Percilla acquired the stage name she would carry for the rest of her career: The Monkey Girl. Lauther disliked the name (he is reported to have said, "She's my daughter, not some freak. "), but it struck a chord with the crowd and stuck. To drive home the comparison, Lauther would exhibit Percilla with a trained chimpanzee named Josephine who rode a bicycle and smoked cigarettes. It was while performing with the Johnny J. Jones Exposition that Percilla became acquainted with the love of her life, Emmitt Bejano, the Alligator-skinned Man (a.k.a. Lobello). A romance blossomed between the two and — to escape Lauther's protective wrath — the couple eloped one night in 1938, returning to the stage platform as the World's Strangest Married Couple. A year later Percilla gave birth to a daughter, Francine, but the infant quickly succumbed to pneumonia. Percilla and Emmitt worked together for Ringling Brothers and other shows for a number of years. However, after spending several decades in the business the couple retired to a life away from prying eyes — where as Percilla put it, "The show's over." Percilla and Emmitt enjoyed many years of restful retirement together at their home in Tampa. Their long romance ended with Emmitt's death in 1995. Percilla herself passed away in her sleep in February 2001. All grant my exterior appearance is strange and unusual but that does not hinder me from enjoying life to the fullest extent and from participating in the goodness life has to offer the same as yourself. My tribute, The Marriage of Emmitt the Alligator-Skinned Man and Percilla the Monkey-Girl, is to be found here.